Do you live in Michigan or are you visiting Michigan this June? Looking for a place to vacation to during spring? Consider visiting the Mackinac Island Lilac Festival, which will take place from June 3rd to the 12th. 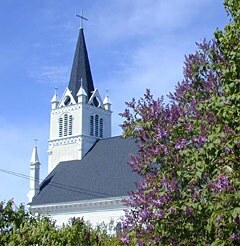 Lilacs are abundant on Mackinac Island during June because of the island’s unique climate that is influenced by Lake Michigan. The climate allows the lilacs to thrive in ways that they don’t in most parts of the world. When you visit the island during June, you’ll quickly see how plentiful and vibrant the lilacs are, bursting with colors that range from purple to pink to white. Each year, Mackinac Island celebrates the lush lilacs with a week-long festival that all ages enjoy. The first lilac was planted on the island more than 150 years ago, so the flower has a deep history there and it’s a treasured sight. During June, when the Mackinac Island Lilac Festival takes over the island, there are plenty of chances to admire the flower and learn more about it. And, of course, you’ll be able to dip your nose into the flower and smell its sweet scent. Since the first festival, back in 1949, residents and visitors of Mackinac Island have been able to view flowers, participate in flower-themed events, and just have a beautiful time on a gorgeous island. The first Mackinac Island Lilac Festival was only a one-day event, but now the festivities last for 10 days and they’re something that everyone should experience at least once. To learn more about the Mackinac Island Lilac Festival, and to see stunning pictures of past festivals, visit the Mackinac Island city website. Visit the Portland Rose Festival this May and June Visiting Amsterdam This Spring? Attend the Annual Amsterdam Tulip Festival Send Love With the Lilac Flower The National Cherry Blossom Festival is Coming to Washington D.C.